If you haven’t met Chris over at Thinly Spread, it is about time you did! She is a wonderful lady with a busy family of 6 (four children that is…) and she still finds time for plenty of hugs, stories, baking, walking, crafting and of course sharing this through blogging! 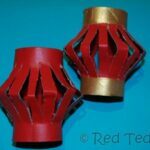 I am pretty certain many of you have made “crackers” before, but I thought it would be nice for Chris to do a Guest Post for you, as her crafts always come out so well. Also, I find it helpful to sometimes have a reference of how others have got crafty! Especially when they come up with tip top crafty “filling” ideas! Go Chris! 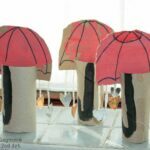 I was delighted when Maggy asked if I would guest post here on Red Ted Art today mainly because I think she’s marvellous but also because it meant I could use that title! 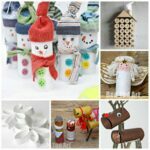 She asked if I would do a little How To… post about cracker making when I revealed in a comment that we have a pile of saved loo roll tubes for that very purpose which threatens to engulf me every time I open the cupboard! 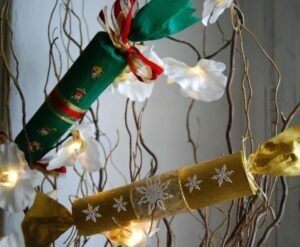 Crackers are so satisfying to make with children because they use up saved bits and bobs very nicely, they are easy peasy and they look fab. 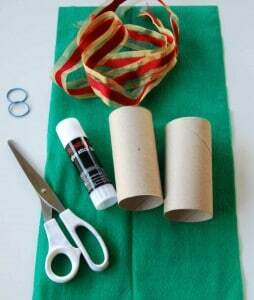 For a basic cracker all you need is 2 empty toilet tubes, some crêpe paper, some saved ribbon, 2 elastic bands, glue, sticky tape and a needle. Cover the toilet tubes with glue (glue sticks work better here than brushing on PVA as crêpe paper has a horrible tendency to turn to mush in children’s hands. Putting the glue onto the tubes also helps prevent a crêpey disaster!). Holding both tubes carefully roll them up in the crepe paper. 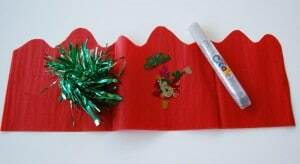 Pop in your gift, joke and paper hat, twist the ends and secure with elastic bands. 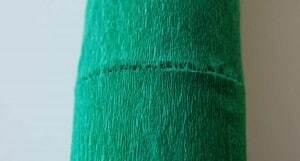 To make cracking the crackers easier we have found that puncturing the crepe paper with a needle where the tubes join gives it a helping hand and avoids a tug of war over the Christmas table! Now all you have to do is decorate it. We usually put a circle of ribbon around the join and sellotape it at the back (don’t stick it on or you will undo all your good work with the needle!). You can decorate it with anything you have to hand. We always have stickers and confetti around as well as glitter glue and tinsel because I stock up when the shops are selling things off in January! A cracker wouldn’t be a cracker without a silly hat inside, a joke and a little gift. 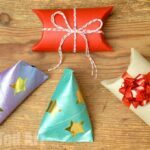 One good idea for these crackers is to make tissue paper hats and then pop in the things to decorate it with as the gift! To make the hats fold a piece of tissue paper in half, measure a 30 cm length (the length of a school ruler and when unfolded it will give you 60cm which goes nicely around a head. 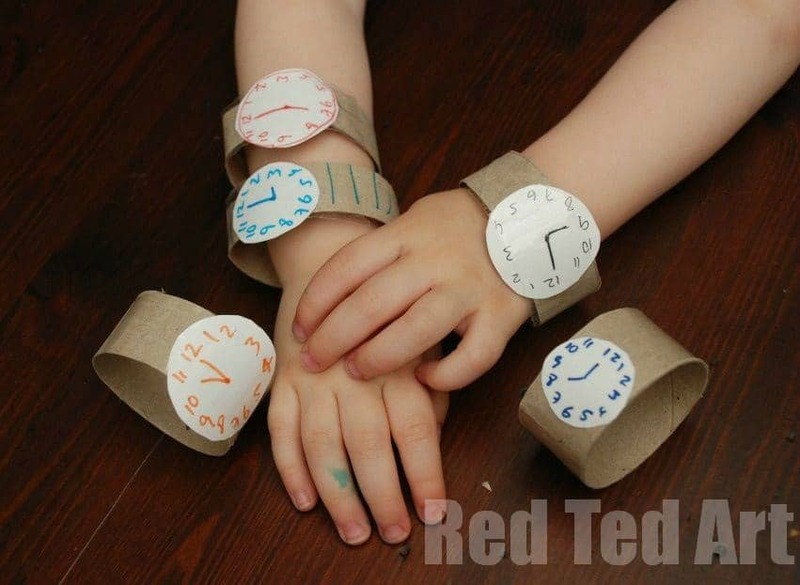 Make them a little smaller if you have very little ones or they will drop over their eyes!). 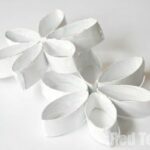 Now cut a wavy or pointy edge to make it look like a crown. Stick the loose edge together. Of course, you need a good supply of corny jokes. We rely quite heavily on the Denis the Menace Joke Book and the Corny Jokes for Kids website. My 4 year old (Bonus Boy) particularly enjoys ‘Why did the Chicken cross the road?’ jokes at the moment. As this is the fourth time round for me they are growing a little stale. I never tire of the donkey joke though. 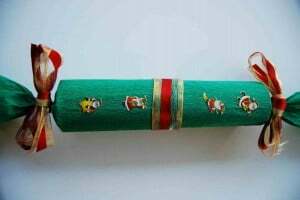 You can buy cracker bangs to go inside your glorious home made offerings but we find that shouting ‘BANG’ very loudly does the trick and makes everyone laugh, a lot! Once you have got the hang of rolling crêpe paper around loo rolls the only limit is your imagination. 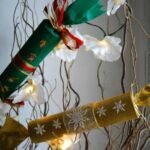 We will be making these glamorous crackers as presents for adults and we will be popping a home-made chocolate truffle inside each one. 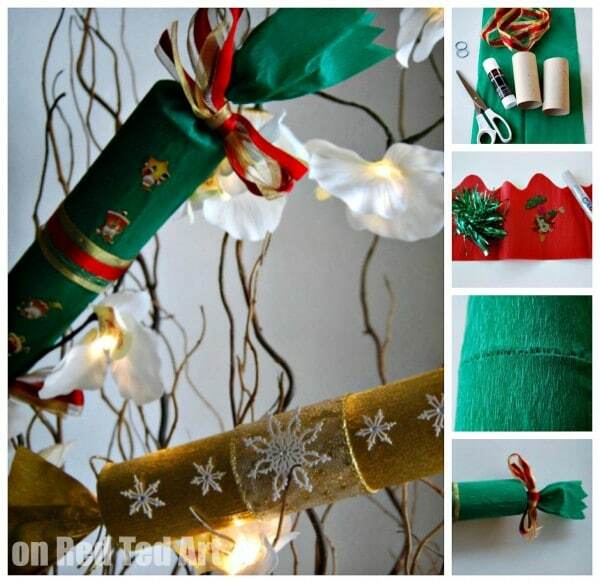 They make great decorations and you can make them with one loo roll holder and without contents if you want to. They can be strung up as a mobile or piled up in a bowl on the table or used to decorate a tree. I told you they were good! I especially liked the joke. If you enjoyed this tutorial, why not let Chris know, by hopping over and visiting her at Thinly Spread. She would love your visit! Crumbs! You two will be taking over the opwrld soon!! Fab to see you both together!! It’s nice to make your own because you can put into them stuff you want. Marvellous post Chris, we will definitely be doing this. Oh, this is super exciting for us as you can’t buy crackers here in Switzerland (well except from the over priced shops aimed at expats). I love these! A super cheap and fun-to-make alternative to the store bought variety! Beautiful! I’m blog hopping and found your blog. I’m a new follower. Would love for you to check out my blog and follow back! What a great idea! I have been saving empty toilet rolls because I knew they’d come in handy for *something*. 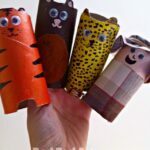 I know my little girl will love making these with me…thanks for the inspiration! Haven`t made them before. Should try this year! The wonky donkey joke is one of my all time favourites! Your website is bringing out the art & craftiest in me again! Was so good at school & did art a level too. 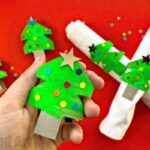 Now I am slowly getting back in to it and love making these Xmas crackers, which I do every year for the pre-school Xmas Fair. And there is another tomorrow! It’s pleasant to make your own particular since you can put into them stuff you need.